An unexpected joy of the 52 Ancestors blogging challenge is learning about new members in my family tree and their interesting, sometimes quirky stories. Like this one. Georgia Vakendis (1929-2001) is my 2nd cousin 1x removed. In the summer of 1949 she apparently won a free pint of Cunningham's Famous Ice Cream. 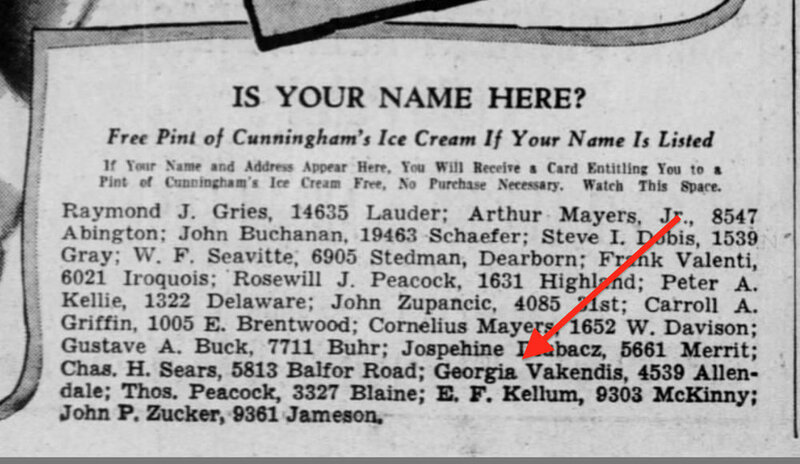 I discovered this advertisement in Detroit Free Press while researching the Vakendis family name in my tree. In the bottom right corner of the ad you see an "Is Your Name Here?" paragraph listing the winners of the ice cream. Georgia's name and address is on the third line from the bottom. She lived at 4539 Allendale, presumably in Detroit. My research indicates that Georgia was the granddaughter of Diamandia Chardoulias Vakendis. 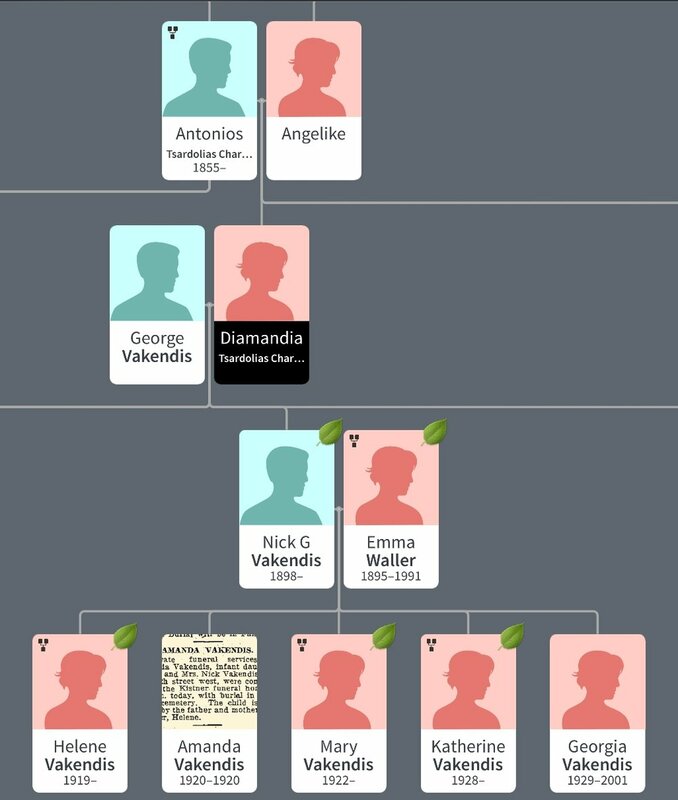 Diamandia was the half sister of my great grandmother, Maria Chardoulias Halvangis (1894-1951). Both Maria and Diamandia were born in Samos, Greece. I believe that Diamandia remained in Greece while Maria came to the United States. Georgia was the youngest child of Nick George Vakendis (abt. 1898) and Emma Waller Vakendis (1895-1991). I considered the possibility that this newspaper article refers to a 2nd Georgia Vakendis (there were two first cousins named Georgia Vakendis), but I am quite confident that I have the correct one. To be sure, I did some more newspaper searching for "Vakendis" and came across this article, just a few months later. There was a Nick Vakendis who lived at 4549 Allendale, just 10 digits off from Georgia's given address. He apparently owned a grocery store nearby and was held up for $200. Being 54 in 1949 would mean Nick was born a few years earlier than the 1898 that I have estimated. But, the fact of the near matching home addresses (probably a duplex) leads me to believe that this man is Georgia's father. Age 72 August 31, 2001. Retired from the State of Michigan as an Employment Interviewer after 20 yrs. of service. Beloved sister of Katherine Nueman and Mary Sitts. Funeral arrangements were private. For further information, call Haley Funeral Directors, 248-356-4800. She will be missed by many. It appears that Georgia did not marry or have children. There may very well be some people in my extended family who knew her or stories about her. I will be doing some more research. Did Georgia ever collect her pint of ice cream? What flavor did she choose? What was her father's grocery store like? Does the building still exists? 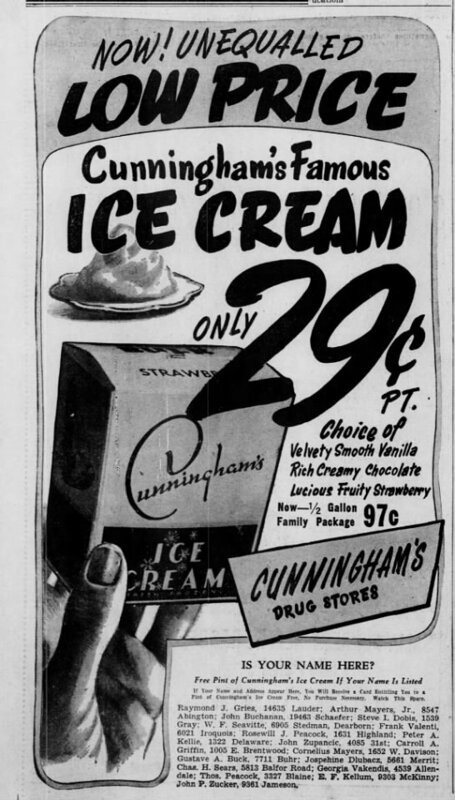 Did her father sell Cunningham's Famous Ice Cream at his store? What else is known about Georgia between 1949 and her death in 2001? What do you think, feel, and wonder about as you hear Georgia's story? Georgia died less than two weeks before the terrorist attacks on September 11, 2001.
Who tells the stories of the childless in your family trees? Thanks for taking time to read this. Though it is not a pint of ice cream, I do have a free gift for you. Details below! This is the 34th of 52 weekly posts planned for 2018. It was inspired by the #52Ancestors writing challenge issued by professional genealogist, Amy Crow Johnson. The challenge: once a week, for all 52 weeks of the year, write about a relative in your family tree. This is Paraskevi Tsardoulias (Παρασκευή Τσαρδούλιας). She is my 1st cousin 2x removed. She was a member of the Εθνική Οργάνωσις Νεολαίας, a National Youth Organization of Greece. This is what I know of her story.